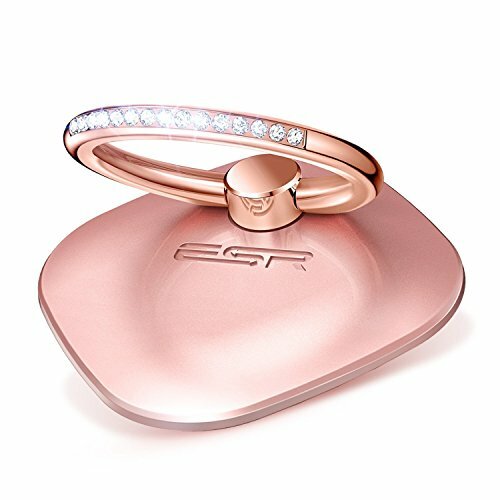 ESR Phone Ring Stand with Bling Crystals, 360° Rotation Ring Holder Finger Grip [Washable] [Removable] Universal Zinc Alloy Kickstand for iPhone 7 7 Plus 6s Galaxy S8 S7 Edge- Rose Gold by ESR at Got Busted Mobile. MPN: 4326547200. Hurry! Limited time offer. Offer valid only while supplies last. Sparkling Design: 15 selected crystals on the ring makes your phone look fashionable. Move free, Stand Firm: 360-degree + 180-degree two-dimension rotation, free-style position. Washable & re-usable: Wash it, leave it dry, and then reuse it time and time again. If you have any questions about this product by ESR, contact us by completing and submitting the form below. If you are looking for a specif part number, please include it with your message.